The S-Monovette® is the revolution in blood collection. The S-Monovette® is an innovative enclosed blood collection system that allows the user to draw blood from the patient using the syringe or vacuum method, uniting the advantages of both techniques in a single product. When used as a syringe, the phlebotomist has full control over the speed at which the blood is drawn into the tube. This is particularly useful for patients with fragile veins, such as the very young or elderly, where the use of the aspiration technique prevents even the most fragile veins from collapsing. When the tube has been filled, the plunger is simply snapped off to leave a primary sample tube which can be centrifuged and is compatible with all major analysers. The S-Monovette® can also be used as an evacuated tube by drawing the plunger fully down and snapping it off immediately prior to blood collection. This creates a fresh vacuum and ensures a precise filling volume, ensuring a correct dilution ratio. The reduced vacuum pressure in the S-Monovette® drastically reduces the rate of haemolysis and vein collapse, meaning increased sample quality and reduced costs associated with repeat collections. Furthermore, unlike pre-evacuated tubes, the S-Monovette® does not have to hold a vacuum for many months after manufacture, which allows the membrane stopper to be thinner and more easily penetrated by the needle sheath. This minimises the movement of the needle in the vein when attaching the tube, ensuring optimum patient comfort. The S-Monovette® needle is ready to use so that there is no need for assembly to a holder. 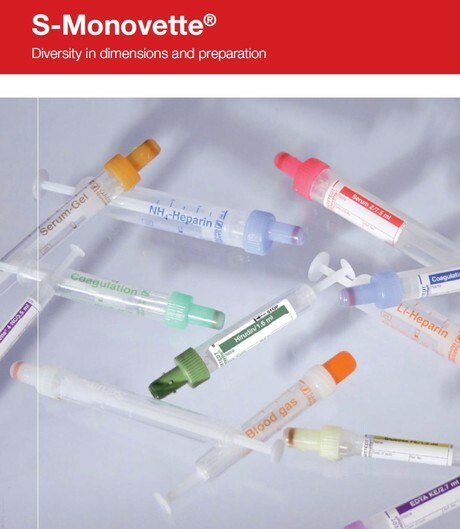 The needle is of a compact, low profile design, which reduces the chance of haematoma by allowing for a reduced angle of puncture and eliminates the possibility of needle stick injury caused by assembly of the needle and holder. The compact design also results in approximately one sixth of the sharps volume caused by using a pre-evacuated system, giving significant cost savings. If you would like a visit from one of our Sales Representatives to demonstrate this system, please contact us on toll free 1800 803 308. For most medical practitioners, choosing a new stethoscope can be an arduous task.